We’ve brought you 12 health-focused apps from last year to help you start 2013 the right way, but we’re already seeing the next wave of fitness apps hit the market this year. And one of these is Fitsby. 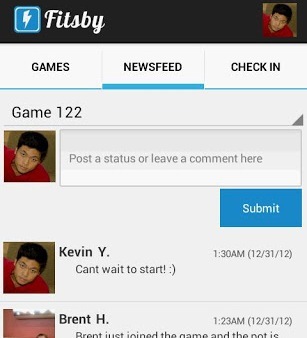 Bucking the typical iOS-first trend, Fitsby hit Google Play first on New Year’s Day, though it will be landing in Apple’s App Store imminently. 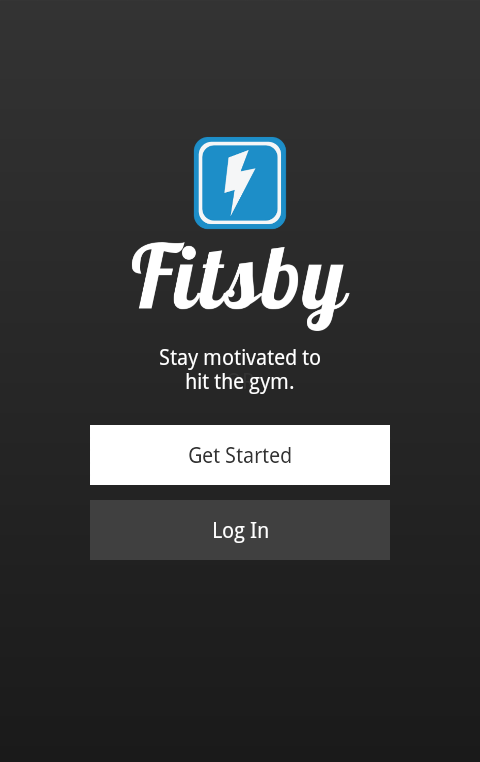 In a nutshell, Fitsby aims to help you stay motivated to hit the gym. 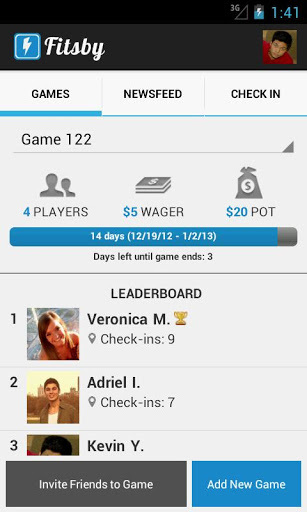 You challenge and compete against friends (or anyone else with the app, for that matter) in a game of gym check-ins. 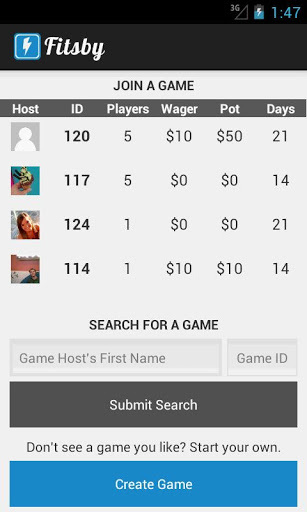 You can bet real money or play for fun, and the top gym-goers in one specific game then split the pot between them and win money from those who didn’t work-out quite as much. When you first launch the app, you’ll be taken through a little explanatory tour of the app. Then, you’ll create an account. Once in, you can choose to join an existing game, or create your own. When I checked it out, there weren’t actually any games going on at first, but I checked back 20 minutes later and there were a few. The app’s founders tell me this was due to server-speed issues. But assuming there are games set-up, it should look a little something like this…you can also see the number of check-ins each user has in a given period of time. You can also have a little ‘banter’ between friends on each game in the Newsfeed. A check-in counts if you’re there for at lest 30 minutes, and it taps the powers of GPS to ensure you’re at least at the gym. But if you check-in at an unknown place, the user must submit the gym name through the app, and the location coordinates are also sent. Fitsby then verifies that gym exists – if it does, it’s added to the Google Places API, and if it doesn’t, the user’s check-in is discarded. This is all very well and good, but from what I can tell there’s no way of knowing how hard someone is actually working out. 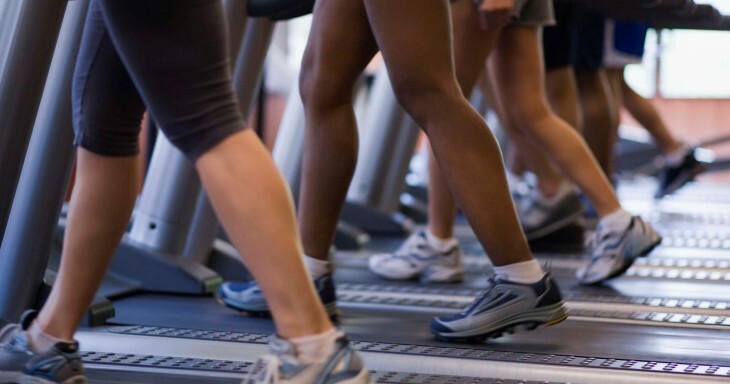 So you could, in theory, go 7 days a week and walk on a treadmill for 30 minutes, while your friend could go 5 days a week, stay for 1.5 hours and run a half-marathon each time. Working out isn’t just about quantity, it’s about quality too. Now, if you don’t see any games you like, you simply create your own and invite others to join. 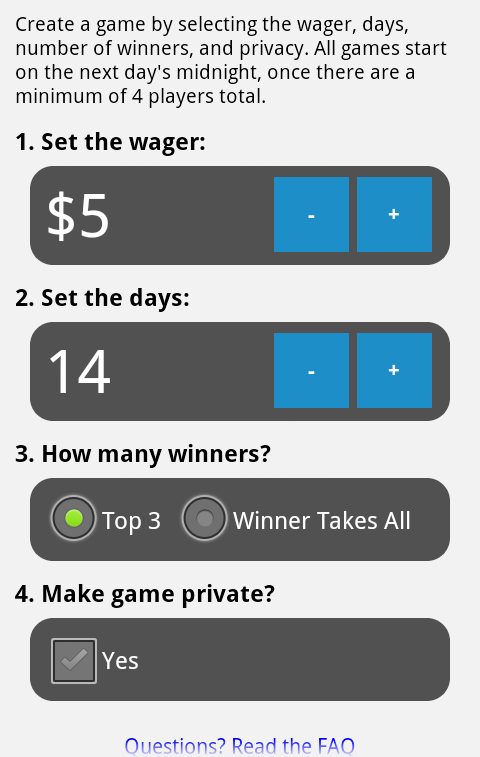 You set the wager, number of days, how many winners and whether to make the game private to your friends only. 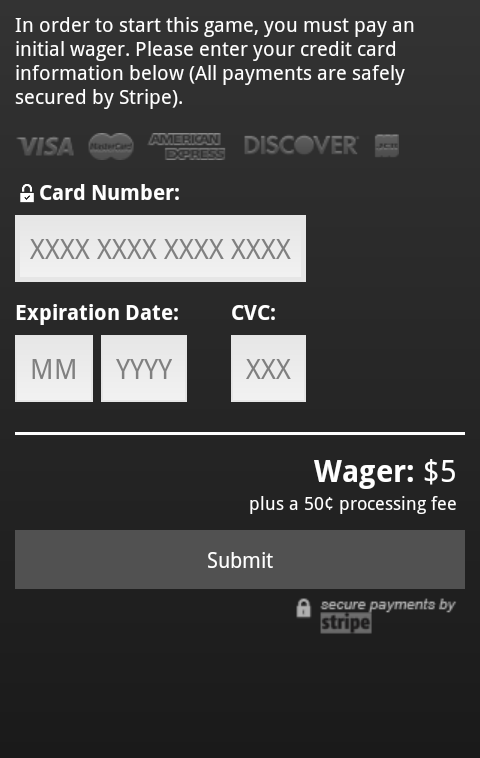 Oh, and you will also have to submit your bank card details if you’re putting real money on the game. 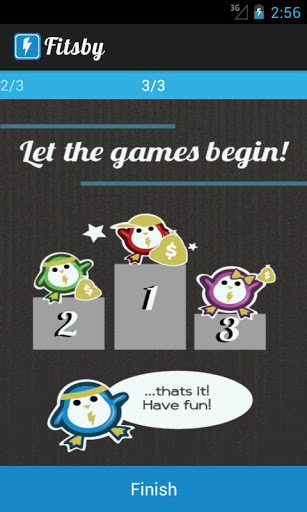 If you’re playing just for fun, then you’ll have to reduce the wager to $0. You can then invite friends from your contacts list on your phone, or though Facebook/Twitter. And you’re good to go. 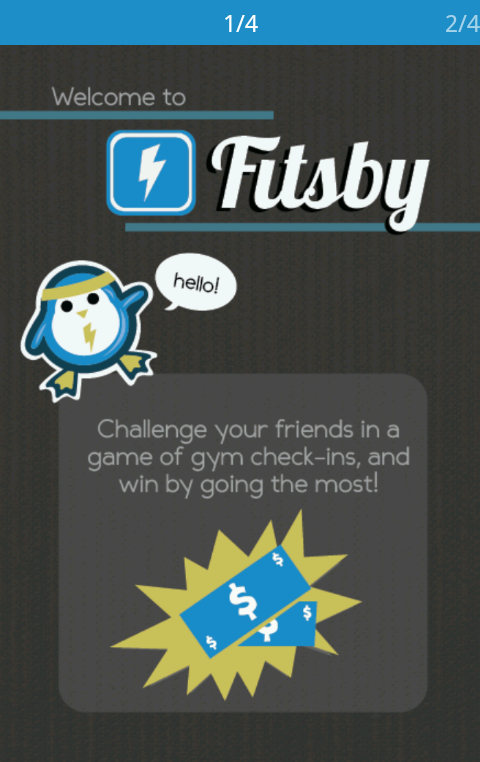 Fitsby isn’t the first motivational app to encourage people to hit the gym. GymPact, too, offers motivational fees, where users agree to pay more if they miss their scheduled workouts. It operates by negotiating a group rate with Planet Fitness, then pays off the membership fees for participants. They will agree on a weekly schedule and if the members miss a session or opt out of the program for unexcused reasons, they will have to pay. That money is then used to pay for more gym memberships and to build a financial aid fund. RunKeeper actually reeled in GymPact last year too, to let users earn (or lose) real money by sticking to their fitness goals. It’s probably also worth mentioning Yog, which lets you schedule runs with friends and strangers around the world. 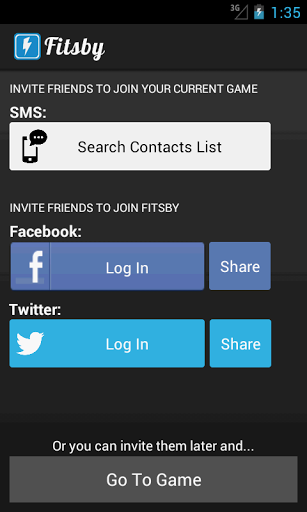 Whether Fitsby can carve a niche for itself in the increasingly competitive tech-fitness space remains to be seen. It’s available to download for free now on Google Play, with iOS to follow soon.